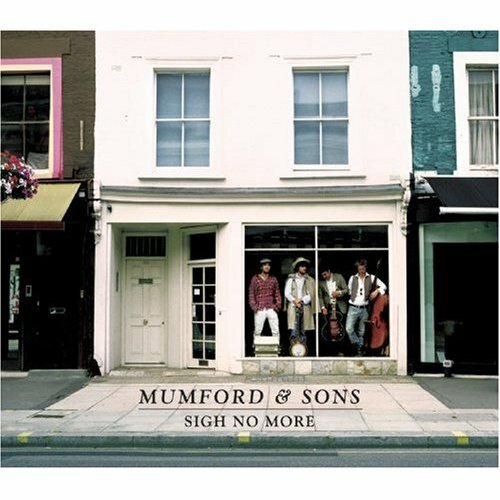 Mumford & Sons are the latest band to come out of the now fairly notable English Folk scene along with bands like Noah & the Whale and Laura Marling. I know I mention many albums on these pages as being great and the "next big thing", but not all of them had staying power or maybe just didn't really quite deserve it. That's not the case with Mumford & Sons debut full length album, Sigh No More (out now in the UK; out February 16th in the US), because it's really one of the best albums I've heard in a long while. Mumford & Sons are a folk/rock band with lots of strings, fantastic songwriting and one of the best debut albums in recent memory. So many of the tracks build up slowly throughout the song to a big epic swell of a grand finale (a la Arcade Fire), which is something I've always loved. Songs like the title track and 'Little Lion Man' are perfect examples of songs that build to a chaotic end and, frankly, just rock. Even a song you think might seem like a more mellow tune in the beginning like 'Thistles & Weeds' has one of the most emotional and powerful endings on the album. I really can't speak highly of this album enough. Time will tell if anything else in 2010 is better, but so far, nothing else is really close (maybe Beach House). If you know me and we like a lot of the same music, you need to get this album. If you read this site and you like what I recommend, you need this album. If there is anything right with the world, these guys will get all the hype and accolades an overrated band like Vampire Weekend seems to get. Currently their tour dates in the US are limited, but I'll be sure to post something if they come anywhere close.